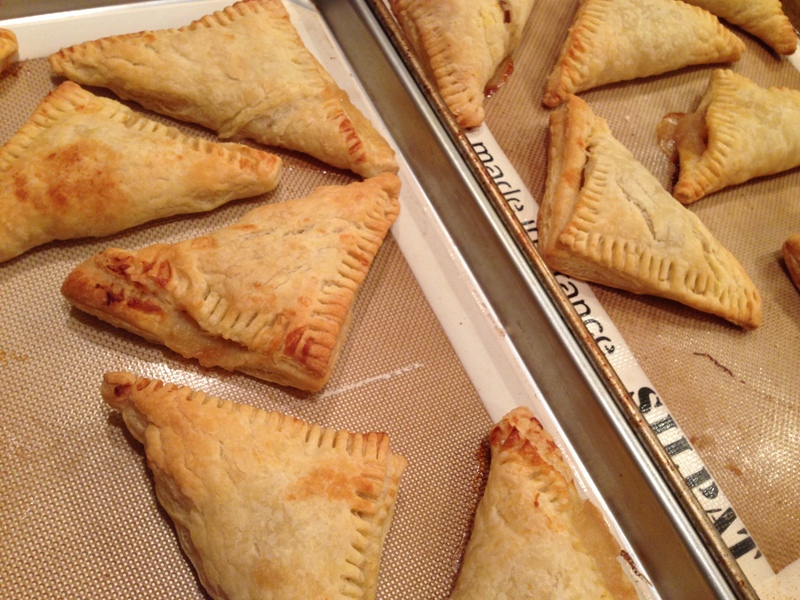 There was some leftover apple pie filling in the freezer so I decided to try making apple turnovers. I make apple pie with a precooked filling; it comes out so much better than raw apples. Plus, after apple picking you can make a bunch of fillings and freeze them. Then thaw, dump in (homemade) pie crust, and bake. I’ve never worked with puff pastry before so I bought the cheapest option – store brand. They were great and quickly disappeared. But, one batch didn’t use all the filling so I went back for some more. This time Pepperidge Farm was on sale cheaper than the store brand so I bought it. I liked the store brand better. Pepperidge Farm had a lot of extra flour, which did make unfolding easier, but it also made crimping harder. It was also much stiffer so the dough cracked when it folded over. It was flakier when baked, but maybe overly so. I took some pictures though, because they’re still pretty good!